Min Kyung arrives at the home and Kwang Hee is shocked at seeing her. It turns out that she’s going to be his manager, but he has a little fit because he and her are on different levels! He bets that she doesn’t even know him and she corrects him, she does…except she says his name wrong which makes the others laugh. They try to decide living arrangements and Dong Yup tries to get Min Kyung and his “mom” to share a room while he sleeps with the vampires. Back at their room, it’s been settled that Min Kyung would room with Soo Mi which she pouts at. Dong Yup tries to make her feel better by telling her they have to do even though he’s pretty much just trying to get away from her. Min Kyung walks in a bit shy and asks if she could really sleep here and Dong Yup says yes and just urges her to go to sleep while he escapes. Back at the vampire room, the vampires are meditating and Dong Yup comes in, happy that he’s a free man. Prince Jung tells him to kneel so he can give his blessings to Dong Yup, but when he’s about to do it, Dong Yup gets interrupted by a phone call. Based on the conversation, it’s some younger girl (omo, an affair?! ), however he ends the conversation when he sees the minions’ glares and Prince Jung’s frozen position. Dong Yup tries to console the Prince, but it doesn’t matter. Prince Jung is more interested in his smart phone. Dong Yup explains what it is: it’s a something used to talk to people, take pictures, etc. Jong Hyun starts explaining what it is and how you can use the internet and have apps, but Prince Jung tells him to make it short, as usual. Soo Mi can’t sleep so she texts Dong Yup that she’s misses him and everything, only to get no response. 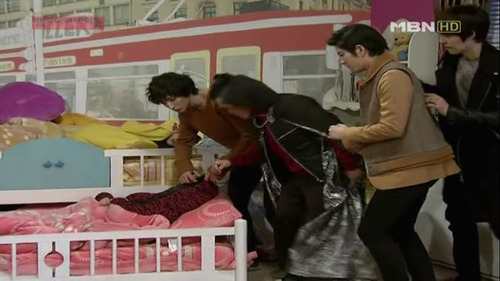 She gets huffy and starts shouting sarcastically that he should sleep well which wakes up Min Kyung. Min Kyung apologizes for being so tired, thinking that little jab was for her. Woo Bin hangs out with Toki again: helping her out with her job, going shopping and even taking pictures. It’s such a cute date! 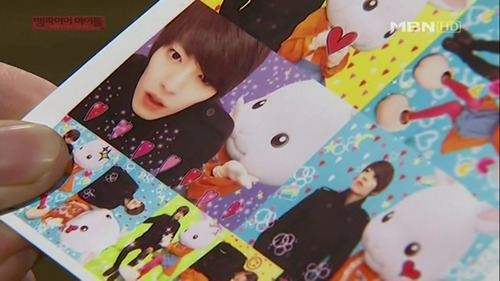 Woo Bin shows Yu Bi the photos and Prince Jung sees them. Prince Jung gets jealous of their friendship and is curious about whether Yu Bi is ugly or not (something like that). Dong Yup jokes: maybe she’s like the ring girl, but the vampires don’t get it. 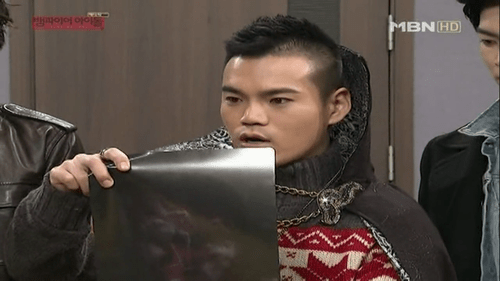 Yu Bi’s worn the hood for a long time and that makes Prince Jung even more curious. They make a bet, if the vampires can uncover Yu Bi’s hood, they get Dong Yup’s smart phone, but if the vampires fail, Dong Yup gets Prince Jung’s red cubic zirconium necklace. Soo Hyuk scoffs at Dong Yup’s guts, but Prince Jung agrees. They are Vampire Deuce’s best vampires, they can do a simple task. Soo Mi drags Dong Yup to their room and scolds him for not texting back and he makes some excuse about Woo Bin playing with his phone the whole night – he couldn’t sleep either without her. She decides that instead of texting, he’ll come to her when she makes cat noises. When Girls Girls come back after a tiring day, Prince Jung decides to take action. He asks Yu Bi nicely to take off her hood, but she texts no! Thus begins the different tactics. The first tactic is using a spy camera while she washes her face, but the steam fogs the lenses. Poor Woo Bin has to be the stool while Soo Hyuk steps on him lol. Yu Bi opens the door as the vampires run off, but Woo Bin gets caught. Yu Bi texts that they should stop because she doesn’t want to unveil her face and that they’re friends, aren’t they? Woo Bin’s stuck in the middle. Soo Hyuk decides to use force next when Yu Bi walks up to them, but it turns out to be Soo Yun. The girls call them idiots. Yu Bi gives Woo Bin the thumbs up and Prince Jung senses some betrayal. Woo Bin kneels down in apology, there must be some important reason why Yu Bi doesn’t take off her hood, but Prince Jung won’t hear of this insolence. Woo Bin ends up going out into the living room and awkwardly greeting Yu Bi. He tries to warn her about the night ambush as fast as he could before scurrying off (aww such a nice vampire). Later that night, the vampires sneak into the girls’ room and Prince Jung gets distracted by the sight of a sleeping Woo Hee. They unzip Yu Bi’s hoodie only to find another hood which scares them. The girls wake up and kick them out. Dong Yup takes a picture of their failure when the vampires go back to their room. He jokes that he’ll send them the picture, but oh right…the prince doesn’t have a smart phone. 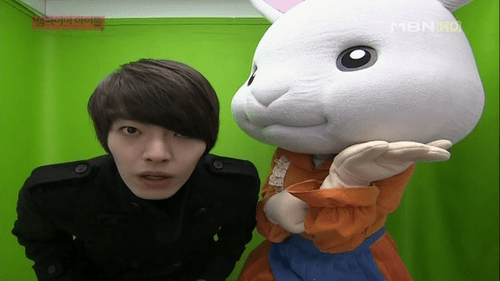 Prince Jung shouts that it must have been Woo Bin who betrayed them and Woo Bin says a robotic no. Prince Jung knows he’s lying and gives Woo Bin one more chance, suddenly they hear cat noises. The vampires all know it’s Soo Mi, but Dong Yup tells them to be quiet. The vampires sit there and watch a conflicted Dong Yup. Soo Mi ends up heading back to her room and blames Min Kyung for all this. She decides the only way to get Min Kyung to leave the room would be to a noisy sleeper, but whatever she does, it doesn’t work since Min Kyung’s a heavy sleeper. 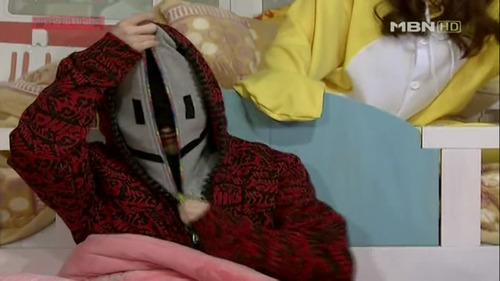 It’s only when Soo Mi shouts in her ear that Min Kyung gets up to yell at her before falling asleep again. Soo Hyuk, Prince Jung, and Jong Hyun do a quiet cheer for themselves and sneak up on Yu Bi and Woo Bin, who is trying to distract her. They grab her, she struggles and faints. 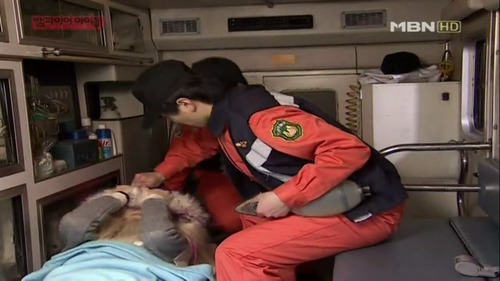 Even in the ambulance, Yu Bi doesn’t let go of her hood LOL. The vampires scurry into the room and declare that they have a picture of Yu Bi’s face. They show Dong Yup the x-ray scans HAHA. It counts because it shows her eyes, nose and mouth technically. Dong Yup buys them a smart phone, but it’s only the box! Min Kyung sit in the kitchen with Jenny and Soo Mi for a little while before leaving since Kwang Hee’s car is coming. Soo Mi drinks alcohol as a stress reliever and gets an idea. She reports to the president that she found alcohol in the girls’ room and that they should have Min Kyung stay in their room as a spy. The girls protest about the alcohol, but the president won’t have it. Woo Hee gets mad and Minah shouts that she hates the president. The president replies that he hates all of them (haha). Soo Mi goes and picks up her “son” while the vampires have a smug look on their faces. Dong Yup looks back at the room one more time, reminiscing all the great times he had in this room for this episode (haha). The vampires wave goodbye at him smugly, ooh the petty revenge.